Discussion in 'HCRU Crabitat's - Biography's Of Our Crabitats' started by j'field, Oct 10, 2009. Hi, I am still quite new in all this crap/crab. And this is my crabitat. Any comments and advise are most welcome. I have done some changes to my crabitat above. I have added more sand. And I also change the pool container of saltwater and fresh water from pink to brown and green colour. I have also added much more shells for them. I feels the the pink is too strong a colour. At least to me. Yes, pink does stand out. . . I'm glad you changed it. . . Also, good for you for adding more shells!!! 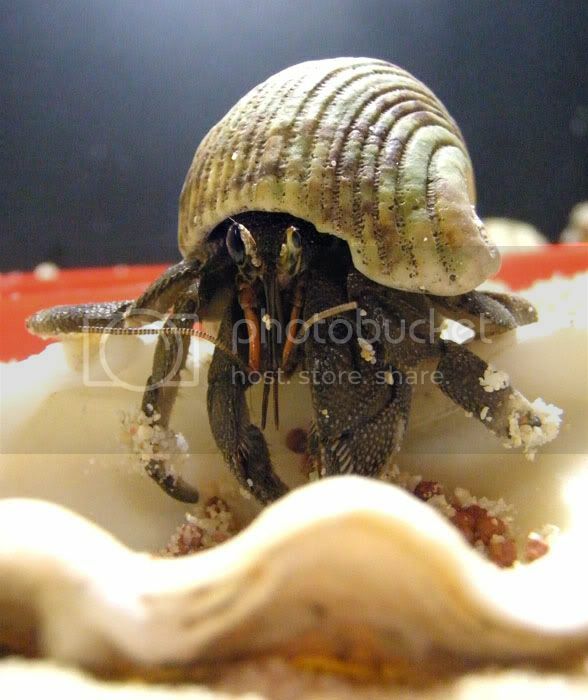 The rule is 3-4 shells a hermie, but that rule is a stupid one!!! The more shells, the better!!! I don't think your crabitat is bad at all! I love it! My only suggestion would to maybe get one more hidey. And just making sure, you have a humidity gauge, right? I love the wood thing!! It's so cool! What kind of wood is it? Make sure you don't use pine because it's toxic to hermit crabs. And like cloie sand, more sand in their would be good. 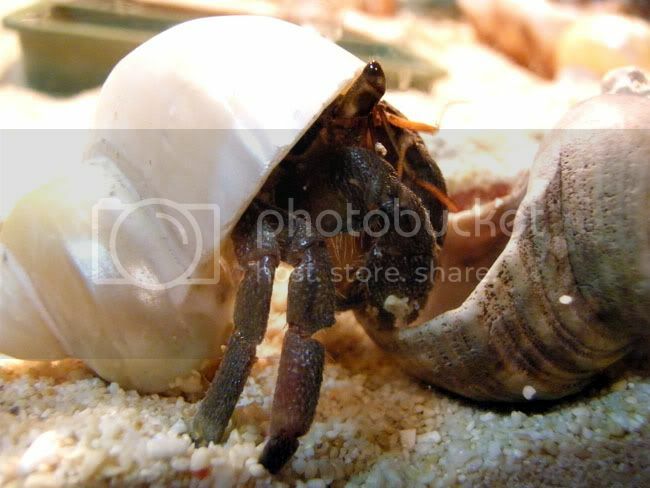 Hermit crabs love to dig and they need to be fully buried when they molt. How much more sand did you add? It should be twice as deep as your biggest crab. Also it looks a little dry, sand should be sand castle consistency, if you stick your finger in it it the hole you make should not collapse but if you squeeze a handful it should not drip. You can moisten it by using their salt water and mix it up real good, The salt water also helps prevent mold. Yes, of course!!! But shells do take up tank space!!! There is such a thing as TOO MANY SHELLS!!! Yes, I have add much more sand and shells. I will post a update soon. And for temperature, my country is hot all year round. So temperature range from 27 to 31 degrees. I think is find right? The link above is the Hygrometer I intend to get. What you guys think? That sounds okay. 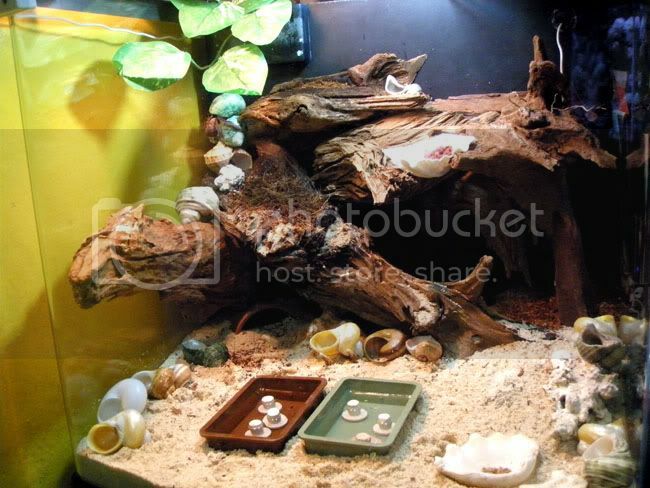 . . How many hermit crabs do you have, and how many gallons is your crabitat??? About 2weeks under my care. How many hermies do you have??? How many gallons is your current crabitat??? Hi Hermies4Ever, think my tank is about 30 gallons. How many hermits you think can I fit in it? Right now I have 2 ruggies. And I think they belong to the tiny size. Between 1 and half to 2 inches. And about the Hygrometer, what you think? I'm not so worry about the temperature here. Cos in my country, temperature is very consistent. Even without a thermometer is ok. And with the heat from my light, it will not fall below 27degrees. By the way, I am using Sun Glo from Exo Terra. And yes, sorry, I forget to reply some of the other questions. The wood I am using is called drift wood. I don't think is pine wood from the look. Is that kind of wood you would normally see in those fresh water planted tanks that most people use for scaping. I am thinking of planting some danallion plants on the second level of sand which you see. 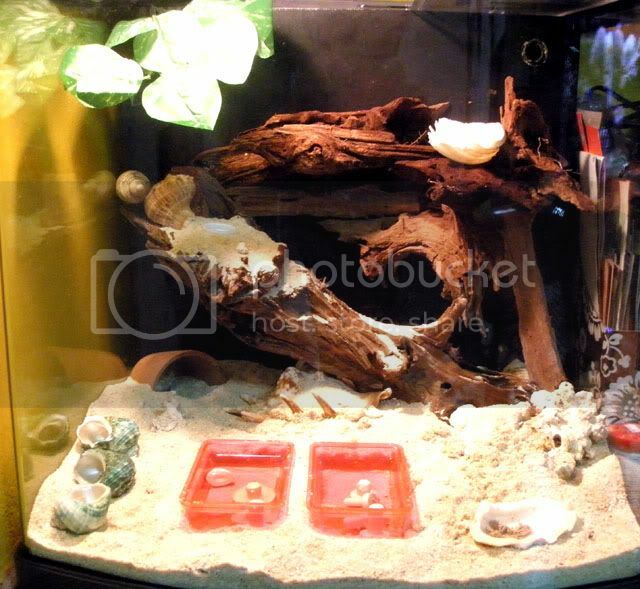 You can fit 10 small hermit crabs in a 30-gallon tank, and if you have medium hermit crabs you can fit 5. . . And yes, a hydrometer is fine. . . I reccomend that you get one. . .
You're welcome!!! Glad to help!!! What do you feed your hermies as treats??? I feed pellets fish food that I use to feed my marine fishes, raisins, corns, bread, tomatoes. Almost everything safe and edible that I can find in my house. Lol! I am thinking of planting some dandelion plant at the second level of sand for them to eat and play. What you think? Dandelions sound terrific!!! I bet your hermies will love them to eat AND to play in!!! I feed my hermies coconut, pellet food, tropical fish flakes, and they also like calcium sand. . .
tHANKS Hermies4Ever, you have been helpful. Are there anything that they cannot eat? I heard so dairy stuffs is not for them. For calcium, I have calcium in my saltwater as well which I use for my marine tank. And I have afew rocks that I use previously for my marine tank. These rocks do have calcium on them too. That humidity guage is probably more than you need I know you are not in the USA but you still should be able to find one much cheaper than that. Thanks cloie74, I will take note of that. And I really can't find a hygrometer here in my country. Anyway, here's another pic of my crabitat. I've added bit more woody for them to exercise. And they must climb to the higher level to get their treats. The gorund level, I put normal for like pellets, freeze dried shrimps, basically dry stuffs. And the higher level, will be treats like fruits, veggies etc.